It can be helpful for you to set something up with another parent or two so that you will all join with one another when it comes to getting your children to and from school. It is important for you to look out for the safety of the children involved when you get a carpool system set up. When you are driving a vehicle full of children, make sure that everyone is buckled before you put the vehicle into motion. 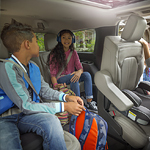 After you have dropped the children at their destination, you should check out the backseat to make sure that everyone has all of their possessions with them and that every child has gotten out of the vehicle and made their way inside. If you are in the market for a vehicle, we have many family friendly options available. Come to our used car dealership to try out something that is perfect for your family and for your carpooling needs.